Sensory neurons regulate how we recognize pain, touch, and the movement and position of our own bodies, but the field of neuroscience is just beginning to unravel this circuitry. Now, new research from the Salk Institute shows how a protein called p75 is critical for pain signaling, which could one day have implications for treating neurological disorders as well as trauma such as spinal cord injury. 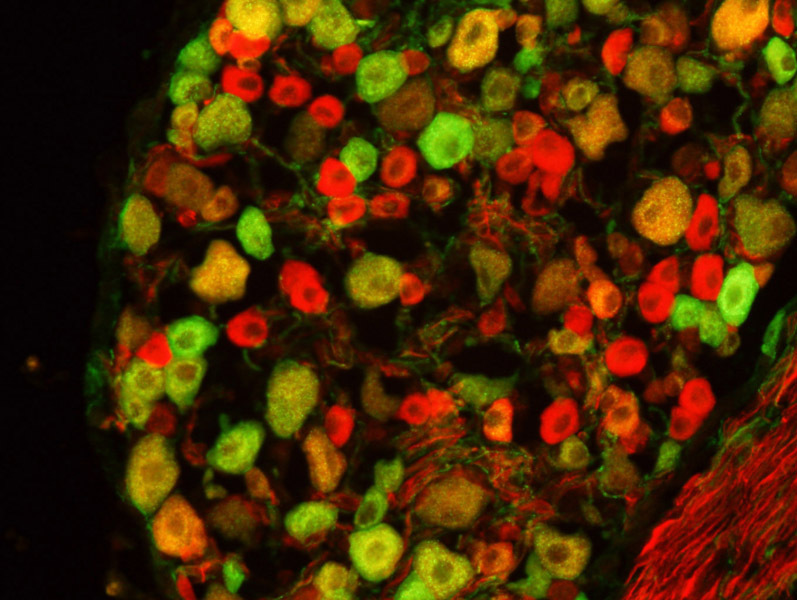 The presence of p75 (green) and Ret (red) together in some sensory neurons suggests that the proteins may interact with each other. Credit: Lee Lab, Salk Institute. “The p75 protein is a busybody. It plays a role in many different signaling pathways,” says Salk Professor Kuo-Fen Lee, holder of the Helen McLoraine Chair in Molecular Neurobiology and co-senior author of the new work. “This complexity makes the protein interesting to study. In this latest research, we discovered that, in addition to its other functions, it’s also required for the survival of certain pain-sensing neurons.” The results are published October 17, 2017, in Cell Reports. Previous research by Lee’s lab had shown that p75 is involved in a signaling pathway that regulates the development of sensory neurons -cells which transmit our sensation of pain, touch and muscle tension -in the dorsal root ganglia. In this latest study, the investigators collaborated with a team at the University of Michigan led by co-senior author Brian Pierchala to further learn about the role of p75 in the development of sensory neurons. They studied mice lacking p75 only in the sensory neurons. When these mice were born, their sensory neurons were normal. But by the time they were six months old, some of those sensory neurons had degenerated, particularly the populations of cells that usually transmit pain signals. It turned out that p75 partners with another class of receptors, called the GDNF (glial cell-derived neurotrophic factor) receptor family. The p75 protein binds to one such receptor called Ret, which is associated with some neurological conditions as well as certain types of cancer. Members of the GDNF family support the survival of sensory neurons that transmit the pain signal and p75 enhances this survival-promoting effect by interacting with Ret. When p75 was removed, the survival-promoting signal from GDNF family members was reduced and the sensory neurons that need this signal to survive gradually degenerated. Future studies will look at the role p75 plays in two other types of cells -glial cells and skin cells. The investigators also plan to look in more detail at the role of p75 in different parts of the body. “We know that in the sacral region, there is a high percentage of sensory neurons with strong p75 expression,” Lee says.